It's possible you will never find another bar or Pub anywhere else in the world themed like this one is. 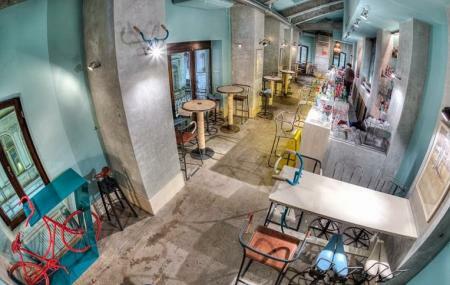 'Bicicleta' means bicycle - and the bar is themed around the two wheeler. The vehicle parts are all handmade, aside from those from old, vintage bicycles. The decor is light and airy and funky as anything. There is a beautiful, long bar (with bicycle seats, of course). Service starts off in the late afternoon with coffee and you get excellent cocktails at night. The DJ is fantastic and the atmosphere is unbeatable. The bar is on the second floor of the building. People normally also visit Pasajul Macca-vilacrosse while planning their trip to Bicicleta. An oasis of calm (at 8 pm) in the hectic Old Town of Bucharest. The barman won't be hurried, which is just as well when he takes 'fresh juice' to the astonishing level of squeezing it in front of you. Well thought out decor, bicycle themed, and laid back music rounds out one cool spot. Innovative bar on the 2nd floor (3rd floor for North Americans) - the entrance is a bit small so easy to miss. The inside is very creative using bike parts to construct the interior from seats to the "curtains" which are made of bike chains. Bartenders are very friendly and nice. They're very open to being creative to mix something special for you. There are also some patio spots which overlook the street. I was born, raised and lived all my life in Bucharest and I cannot think of a more original local bar concept beyond Bicicleta. Everything from the design, to the authenticity, to the bar menu is carefully and thoroughly thought of. Prices are well rounded especially when taking into account the venue's placement. Have a breakfast on the terrace and a friendly chat with Stefan, the owner/manager/bartender and you'll better understand why everyone talks nothing but the best about Bicicleta. Nice place, a bit hide in the middle of the old town. But great to discover, nice music selection and quite atmosphere.